For many years, white interior trim has been most prevalent in homes here in the south. Older homes with dark stained interior doors or trim are often painted white to update the look and feel of a home; however, I’ve started to see a shift toward black or charcoal gray doors and trim in both new construction, recently remodeled homes, and even in new luxury apartments. Homeowners are finding this look both elegant and sophisticated. Almost anything can be painted with the right product, and dark paint can make even the stock builder grade door look classy. You can paint just the interior doors dark and it’s perfectly acceptable to also paint your trim (baseboards and window trim) the same color. Popular color choices for this type of project include Benjamin Moore Graphite, Black Suede by Behr, Onyx Black by Glidden – all in semi-gloss finish. 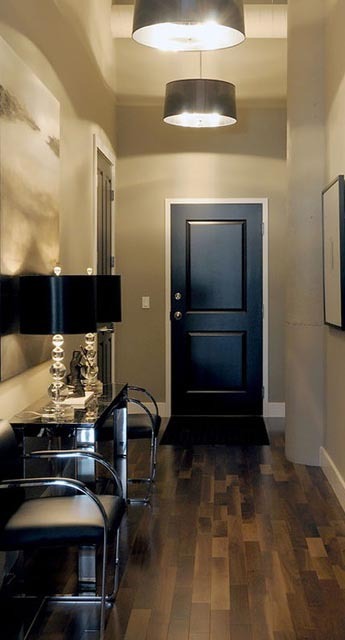 Another interior door trend that has been gaining popularity is the use of decorative barn doors inside the house. This rustic look brings both style and character into a home. I recently worked on a project in Charlotte where the homeowner installed double sliding barn doors in their master bedroom. The dual doors nicely frame the entry into their large and luxurious master bath. Sometimes these doors can be purely decorative such as the kitchen door featured here. 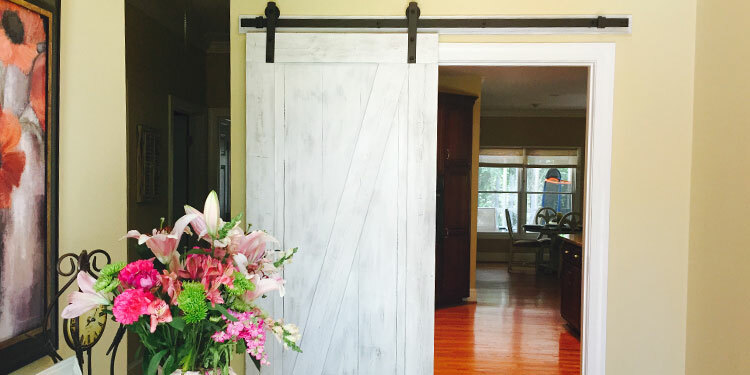 This door frame separates the home’s foyer from the kitchen and this custom barn door makes a statement upon entering the home. The homeowner hired Chad Albertson Rustic Home to design, build, and install for approximately $1,100. The homeowner felt this was a great price given the cost of hardware alone. Readers can view other projects by Albertson on his Facebook page Chad Albertson Rustic Home.